The flag of Azerbaijan (Azerbaijani : Azərbaycan bayrağı) is a horizontal tricolour featuring three equally sized fesses of blue, red, and green, with a white crescent and an eight-pointed star in the center. The tricolour replaced an earlier design used by the Azerbaijan SSR. The blue symbolizes Azerbaijan's Turkic heritage, the red stands for progress, and the green represents Islam. The official colors and size were adopted on 5 February 1991. This flag was used from 9 November 1918 to 1920, when Azerbaijan was independent, and it was revived with slight variations on 5 February 1991. The nickname for the flag is Üçrəngli Bayraq, which means The Tricolour Flag. In heraldry, a fess or fesse is a charge on a coat of arms that takes the form of a band running horizontally across the centre of the shield. Writers disagree in how much of the shield's surface is to be covered by a fess or other ordinary, ranging from one-fifth to one-third. The Oxford Guide to Heraldry states that earlier writers including Leigh, Holme, and Guillim favour one-third, while later writers such as Edmondson favour one-fifth "on the grounds that a bend, pale, or chevron occupying one-third of the field makes the coat look clumsy and disagreeable." A fess is likely to be shown narrower if it is uncharged, that is, if it does not have other charges placed on it, and/or if it is to be shown with charges above and below it; and shown wider if charged. The fess or bar, termed fasce in French heraldry, should not be confused with fasces. The Constitution of Azerbaijan was adopted on 12 November 1995 by popular referendum. This Constitution was the first Constitution of independent Azerbaijan, the Azerbaijan Democratic Republic founded in 1918 and existed 23 months until 1920 was not able to adopt its constitution. Therefore, the history of Constitution building in Azerbaijan generally starts from the period of Azerbaijan being part of Soviet Union. The first Constitution of Azerbaijan SSR was adopted in 1921 and was in accordance with the Constitution of USSR. The last Constitution of Azerbaijan SSR was adopted on 21 April 1978 and also was in line and form of USSR Constitution. The first Constitution of independent Azerbaijan consists of 5 chapters, 12 sections and 147 articles. It was amended on 24 August 2002 and again on 18 March 2009. It carries the "highest legal force" in Azerbaijan as per article 147. The most recent amendments to the Constitution were approved after the Constitutional referendum held on 26 September 2016. In 2002, 31 amendments were made to 22 articles; in 2009, 41 amendments were made to 29 articles; and in 2016, 23 articles were amended and new 6 new articles were added. A war flag, also known as a military flag, battle flag, or standard, is a variant of a national flag for use by a country's military forces when on land. The nautical equivalent is a naval ensign. Under the strictest sense of the term, few countries today currently have proper war flags, most preferring to use instead their state flag or standard national flag for this purpose. The Nakhchivan Autonomous Republic is a landlocked exclave of the Republic of Azerbaijan. The region covers 5,500 km2 (2,100 sq mi) with a population of 414,900, bordering Armenia to the east and north, Iran to the south and west, and Turkey to the northwest. In 1828, after the last Russo-Persian War, several Khanates of the Caucasus were annexed to the Russian Empire . When the Russian Empire collapsed, Russian Azerbaijan declared its independence and joined the short-lived Transcaucasian Democratic Federative Republic, together with Georgia and Armenia. This unified state hardly lasted a year and was soon dissolved. Since the Republic was short-lived, it did not use any flags or symbols. Nevertheless, some historians consider a horizontal gold, black, and red tricolor, similar to that of the German flag but arranged differently, to have been flag of Transcaucasia. The federation was dissolved on 26 May 1918, when Georgia declared its independence as the Democratic Republic of Georgia. Both Armenia and Azerbaijan declared their independence two days later, on 28 May 1918, as the First Republic of Armenia and the Azerbaijan Democratic Republic, respectively. Azerbaijan, officially the Azerbaijan Soviet Socialist Republic, also referred to as Soviet Azerbaijan, was one of the constituent republics of the Soviet Union between 1922 and 1991. Created on 28 April 1920 when Soviet Russia brought pro-Soviet figures to power in the region, the first two years of the Azerbaijani SSR were as an independent country until incorporation into the Transcausasian SFSR, along with the Armenian SSR and the Georgian SSR. "Azərbaycan Marşı" or the March of Azerbaijan, is the national anthem of Azerbaijan. The music was composed by Uzeyir Hajibeyov, with lyrics by poet Ahmad Javad. The government officially adopted the anthem in 1920 with the passage of the decree, "On the State Hymn of the Republic of Azerbaijan." In 1992, after the fall of the Soviet Union, Azerbaijan's government officially restored "Azərbaycan Marşı" as the national anthem. The national flag of Armenia, the Armenian Tricolour, consists of three horizontal bands of equal width, red on the top, blue in the middle, and orange on the bottom. The Armenian Supreme Soviet adopted the current flag on 24 August 1990. On 15 June 2006, the Law on the National Flag of Armenia, governing its usage, was passed by the National Assembly of Armenia. 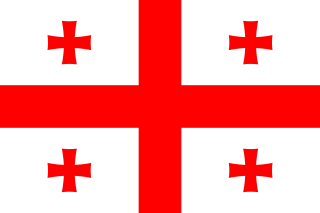 The flag of Georgia, also known as the Five Cross Flag, is one of the national symbols of Georgia. Originally a banner of the medieval Kingdom of Georgia, it was brought back to popular use in the late 20th and early 21st centuries during periods of the Georgian national revival. Prior to obtaining its official status in 2004, the flag was popularized by the United National Movement and served as one of the most recognisable symbols of the Rose Revolution. The state emblem of Azerbaijan mixes traditional and modern symbols. The focal point of the emblem is the fire symbol, and this comes from the fact that Azerbaijan has many everlasting fires which also gives the name "land of eternal fire" – in representation of its original roots in Zoroastrianism. The fire symbol also represents the word الله, the Arabic name for God. It also represents Islam, the dominant religion of Azerbaijan. The national flag of Turkmenistan features a white crescent and five stars representing the five regions of the country. Placed upon a green field is a symbolic representation of the country's famous carpet industry. It was introduced as the flag of Turkmenistan on September 27, 1992 to replace the Soviet-era flag which consisted of a red background with two light blue bars in the middle. The modified version with a 2:3 ratio was adopted on January 24, 2001. The flag of the Azerbaijan Soviet Socialist Republic was a plain red flag with a golden hammer and sickle and a gold-bordered red star in its upper canton and an horizontal blue band on the bottom fourth. The flag of the Kazakh Soviet Socialist Republic was adopted by the Kazakh government on 24 January 1953. 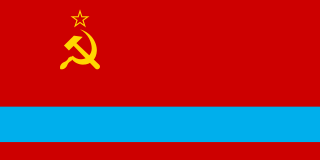 This flag resembles the flag of the Soviet Union in a defaced form but with the three horizontal stripes consisted of the 2/9 (two-ninths) of the blue (azure) bar in lower part of flag and the hammer and sickle in the near centre. The flag of the Kirghiz SSR was adopted by the Presidium of the Supreme Council of the Kirghiz SSR decreed by its Decree on December 22, 1952. The 1978 constitution of the Kirghiz SSR states that the ratio of the flag is 1:2 with the blue/white/blue stripes in the middle taking ​1⁄3 of the flag height and the white stripes ​1⁄20 of flag height. 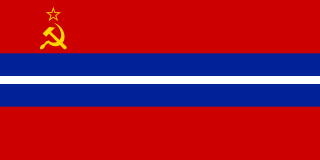 The red, blue and white colors were derived from the Pan-Slavic colors. The flag of the Uzbek SSR was adopted by the Uzbek SSR on 29 August 1952. The red represents the "revolutionary struggle of the working masses", the hammer and sickle represents the peasants' and workers' union, and the red star is the symbol of the communist party. There is no official explanation for the symbolic meanings of other elements. However, in some material the white stripes represent cotton, the blue band represents Amu Darya and irrigation in general. The National Assembly, also transliterated as Milli Majlis, is the legislative branch of government in Azerbaijan. The unicameral National Assembly has 125 deputies: previously 100 members were elected for five-year terms in single-seat constituencies and 25 were members elected by proportional representation; as of the latest election, however, all 125 deputies are returned from single-member constituencies. Milli Majlis was the first secular republican parliament in the Muslim world. Ministry of Foreign Affairs of Azerbaijan is a Cabinet-level governmental agency in Azerbaijan Republic in charge of conducting and designing Azerbaijani Foreign policy. The Ministry of Justice of Azerbaijan is a governmental agency within the Cabinet of Azerbaijan in charge of regulation of the justice system, overseeing the public prosecutor, maintaining the legal system and public order and instituting law reforms. The State Committee on Standardization, Metrology and Patents of Azerbaijan Republic is a governmental agency within the Cabinet of Azerbaijan in charge of Azerbaijani technical regulations, metrology, valuation of technical compliance, accreditation, quality standardsin Azerbaijan Republic. The committee is headed by Ramiz Hasanov. The State Anthem of the Azerbaijan SSR was the anthem of the Azerbaijan Soviet Socialist Republic in the former Soviet Union. It was created in 1944 and was used from 1945 to 1992. The Nakhichevansky Uyezd was a district (uyezd) of the Erivan Governorate of the Caucasus Viceroyalty of the Russian Empire. It bordered the governorate's Sharur-Daralagezsky Uyezd to the north, the Zangezursky Uyezd of the Elisabethpol Governorate to the east, and Persia to the south. It included most of the Nakhichevan exclave of present-day Azerbaijan and the southwesternmost part of the Syunik Province of present-day Armenia. Its administrative center was Nakhichevan. Ahmed bey Pepinov Omar oglu, also known as Ahmet bey Pepinov, was an Azerbaijani statesman of Meskhetian Turkish origin who served as Minister of Agriculture in the fifth cabinet of Azerbaijan Democratic Republic, and was member of Parliament of Azerbaijan. Abbasgulu bey Khanbaba oglu Shadlinski was a Soviet military leader, revolutionary, and commander of a partisan detachment force called "Red camp", which played a significant role in establishment of the Soviet power in Armenia and Nakhchivan. The historian S.P.Aghayan called Shadlinski "the brave son of Azerbaijani people". ↑ "Article 23. Azerbaijan State Symbols". The Permanent Mission of Azerbaijan to the United Nations. Archived from the original on 7 October 2011. Retrieved 6 June 2011. 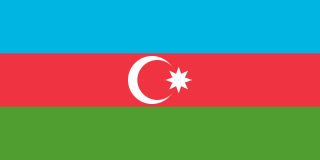 1 2 3 "National flag of Azerbaijan". CRW Flags. 17 June 1999. Retrieved 17 June 2009. 1 2 3 "Azerbaijan marks National Flag Day". Today.az. 9 November 2012. Retrieved 14 November 2012. 1 2 3 Article 23.II of the Constitution "The Constitution of the Republic of Azerbaijan". Official website of the President of the Republic of Azerbaijan. 2002. Archived from the original on July 30, 2013. Retrieved May 28, 2011. 1 2 3 4 Флаг Азербайджана (in Russian). Geraldika.ru. Retrieved 6 June 2011. ↑ 5 февраля 1991 года Верховный Совет Азербайджанской Республики Законом №14-XII утвердил изменение названия государства и Законом №17-XII утвердил изображение Государственного флага и Положение о Государственном флаге Азербайджанской Республики. ↑ "AZS 001-2006. Azərbaycan Respublikasının Dövlət Bayrağı. Texniki şərtlər" (in Azerbaijani). Azərbaycan Respublikasının Standartlaşdırma. 1 2 ""Azərbaycan Respublikası Dövlət bayrağının istifadəsi qaydaları haqqında" Azərbaycan Respublikasının Qanununda dəyişiklik edilməsi barədə" (in Azerbaijani). Azərbaycan Respublikasının Milli Məclisi. ↑ Find a PANTONE color.Pantone LLC. Pantone Color Picker [Retrieved 9 December 2009]. ↑ "Azerbaijan State Symbols". Embassy of Azerbaijan to Canada. Archived from the original on 15 November 2010. Retrieved 6 June 2011. ↑ "Azerbaijan State Symbols". Government of the Republic of Azerbaijan. 2007. Retrieved 9 June 2011. ↑ Hajibeyov, Y. (1919). "number of May 28,". One Year. Azerbaijan. 1 2 "What does the crescent and eight-pointed star on the national flag of Azerbaijan stand for?". Azerbaijan Press Agency. Archived from the original on 25 March 2012. Retrieved 7 November 2008. 1 2 Сабухи Ахмедов, Государственный флаг Азербайджанской Республики (in Russian), citing Мярданов М., Гулийев Я., Азярбайъан Республикасынын дювлят рямзляри. Б., 2001, pp. 74–75. ↑ Sache, Ivan. "Meaning of the flag of Azerbaijan". Intute. Retrieved 17 June 2009. 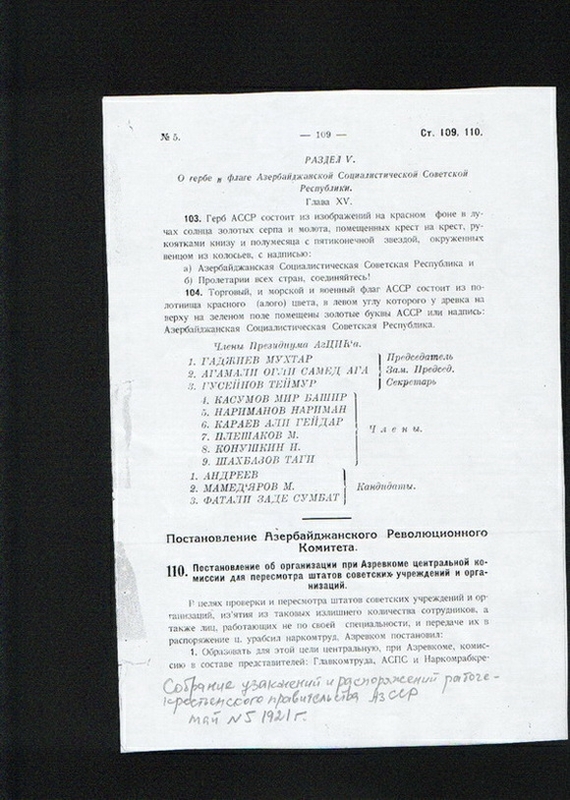 ↑ "Закавказская Федерация (Transcaucasian Democratic Federative Republic)" (in Russian). Russian Centre of Vexillology and Heraldry. 30 May 2003. Archived from the original on 22 June 2006. Retrieved 27 December 2006. ↑ "Article 23. Azerbaijan State Symbols". President of Azerbaijan. Archived from the original on 16 January 2013. Retrieved 14 November 2012. ↑ Tadeusz Swietochowski. Russia and Azerbaijan: A Borderland in Transition. Columbia University Press, 1995. ISBN 0-231-07068-3, ISBN 978-0-231-07068-3 and Reinhard Schulze. A Modern History of the Islamic World. I.B.Tauris, 2000. ISBN 978-1-86064-822-9, ISBN 978-1-86064-822-9. Citations are at Talk:Azerbaijan Democratic Republic#First or second. ↑ Джангировичем Салахлы, Чингизом. Ассамблея уставов и распоряжений рабоче-крестьянское правительство Азербайджанской ССР, № 5, Май 1921 (in Russian). рабоче-крестьянского правительства АзССР, №5. Retrieved 1 May 2009. ↑ Janmammadova, Aygun (7 September 2010). "Azerbaijan: Baku welcomes the world's highest flag… and a strong wind". Global Voices. Retrieved 6 July 2011. ↑ Abbasov, Rafael (29 May 2010). "Tallest unsupported flagpole". Guinness World Record. Archived from the original on 19 December 2015. Retrieved 29 May 2010. 1 2 ""Azərbaycan bayrağına" (Cəfər Cabbarlı)". www.azadliq.org (in Azerbaijani). Retrieved 10 November 2014. ↑ "Dalğalanan bayraqlar" (in Azerbaijani). Medeniyyet. Archived from the original on 27 June 2011. Retrieved 30 May 2009. ↑ "National Anthem of the Republic of Azerbaijan". Embassy of the Republic of Azerbaijan in the People's Republic of China. Wikimedia Commons has media related to Flags of Azerbaijan .